Buttonhole stitch can be used for more than just an edging. These photos of different tiny flowers using the buttonhole stitch will give you some ideas of how the stitch can be incorporated into surface embroidery. This first flower is a stylized hollyhock. For another example of hollylocks shaped differently, check out my hollyhocks embroidered in wool. These pink hollyhocks are embroidered with floche, in buttonhole stitch, with French knots for the centers. The dime is included to give you an idea of the size of the flowers. 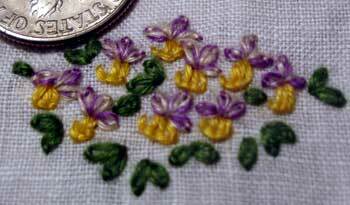 The leaves on these little flowers are also buttonhole stitch, worked on linen using floche. The various shades of pink floche worked in buttonhole stitch here create a stalk of bell-like flowers. This tiny bunch of pansies is also embroidered in floche, using the lazy daisy stitch for the top petals, with the base petals in yellow done in buttonhole. That’s the edge of a dime in the photo. The stitches are tiny! To learn how to work the basic buttonhole stitch, check out the buttonhole video tutorial. Oh, my gosh! Those flowers are sooo tiny! So sweet! Mary, what is the difference between coton a broder and floche, or are they the same thing? Also, I’m looking at the coton a broder on the lacis site and the description is saying 4-ply. After Googling, I found floche on another site but it’s described as 5-ply. Even though coton a broder is “4-ply” it isn’t actually divisible. Well, I guess if you really wanted to you could divide it. But it isn’t meant to be divided. It would “fuzz up” if you tried, methinks. By 4-ply or 5-ply, it means that it is 4 plies twisted together to make one strand. Floche is a lot finer than coton a broder, and I think it’s probably a bit looser on the twist. Yes, that helps a lot! Thank you! I kept looking for the word “nondivisible”, so I thought I wasn’t finding the right thing. Thanks again for another informative piece. I haven’t used much floche but I’m thinking I will. Today I have a problem: telling us that the dime in the photo is so we can see the relative size of the embroidery is fine if we know the size of a dime, lol. I am Australian and never been to your country (worse luck) and so haven’t a clue about the sizes of your coins. I would really like it if you could tell me what actual sizes they are please. I promise to save the info somewhere safe so I don’t have to ask again. oh! god so fabulous button holes heart catching!! Thanks for this. It’s simple and yet strikingly beautiful and looks easy to make. I’m still very much in “X-stitch” embroidery mode and need to get out of it to try different technics.